The RadioShack POS and Web Settlement Agreement was negotiated by Lainey Feingold and Linda Dardarian using Structured Negotiations on behalf of the American Council of the Blind (ACB), the American Foundation for the Blind, and the California Council of the Blind (CCB). 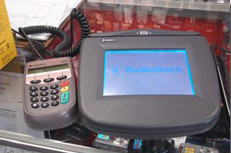 In the Agreement, RadioShack agreed to install tactile point of sale devices in every RadioShack store in the United States and to upgrade its website to comply with the Web Content Accessibility Guidelines (WCAG) promulgated by the Web Accessibility Initiative (WAI) of the World Wide Web Consortium. ACB, a non-profit corporation that provides advocacy services in the United States on behalf of individuals who are blind or have visual impairments, is dedicated to promoting the full integration of persons who are blind or have visual impairments into all aspects of society, and provides information to the general public about the accomplishments, needs and contributions of persons who are blind or visually-impaired. CCB is ACB’s California affiliate serving the needs of blind and visually-impaired persons throughout the State of California. ACB is incorporated and has its place of business in Washington, D.C. CCB is incorporated and has its place of business in the State of California. RadioShack owns and operates retail stores in California and other states across the United States (”RadioShack”). Claimants contend that they and their respective boards, staff, members and clients, and other blind and visually-impaired persons, have been, are being, and continue to be denied full access to the services provided by retail establishments and are therefore being discriminated against due to alleged inaccessibility of certain Point of Sale Devices (defined in Section 1.8 below) found in RadioShack Stores and alleged inaccessibility of www.RadioShack.com. RadioShack denies that it discriminates against blind and visually-impaired persons, including Claimants and their respective boards, staff, members and clients, in any way and specifically denies that it discriminates against such blind and visually-impaired persons due to alleged inaccessibility of certain Point of Sale Devices in the RadioShack Stores and/or the alleged inaccessibility of www.RadioShack.com. The Parties enter into the Full Agreement in order to resolve the dispute and to avoid the burden, expense, and risk of potential litigation. In entering into the Full Agreement, RadioShack does not admit, and specifically denies, that it has violated or failed to comply with any provisions of the Americans with Disabilities Act of 1990, 42 U.S.C. § 12101, et seq., and the Title III implementing regulations, 28 C.F.R., Part 36, and any applicable laws of any state relating to accessibility for persons with disabilities to public accommodations, any regulations or guidelines promulgated pursuant to those statutes, or any other applicable laws, regulations, or legal requirements. Neither the Full Agreement, nor any of its terms or provisions, nor any of the negotiations connected with it, shall be construed as an admission or concession by RadioShack of any such violation or failure to comply with any applicable law. Neither the Full Agreement nor any of its terms and provisions shall be offered or received as evidence for any purpose whatsoever against RadioShack in any action or proceeding, other than a proceeding to enforce the terms of the Full Agreement. Access Laws means the Americans with Disabilities Act (as defined below) and any applicable laws of any state, county or municipality relating to accessibility for persons with disabilities to places of public accommodation, any regulations or guidelines promulgated pursuant to those statutes, or any other applicable disability laws, regulations, or legal requirements, including, without limitation, California Civil Code §§ 51, et seq. and 54, et seq., California Financial Code § 13082, California Health & Safety § 19955, and Title 24 of the California Code of Regulations. Accessible Checkout Counter means a checkout counter where a POS Device is placed and which is utilized by RadioShack employees to assist customers in paying for products or services. Ancillary Raised Button Keypad means a number keypad that is part of a unit separate from the Point of Sale Device but which is plugged into a Point of Sale Device and has the following features: Each key (button) is tactually discernable from surrounding surfaces and adjacent keys; Numeric keys shall be arranged in a 12-key ascending telephone keypad layout; The number five key shall be tactually distinct from the other keys by means of a raised dot; Function keys with contrasting colors and raised tactile markings, as follows: (i) Enter/ Accept (green key with a black raised circle); (ii) Cancel (red key with a black raised X); and (iii) Correct (yellow key with a black raised backward arrow). Claimants agree that the Ingenico ancillary pinpad bearing model number 3010 meets these requirements. An Ancillary Raised Button Keypad may be used to perform the following Functions: input, correct, cancel and enter PIN, telephone number, other numeric information, and cash-back amounts. Effective Date means May 31, 2007. Existing RadioShack Store means a RadioShack store that is open to the public on September 30, 2007. New RadioShack Store means a RadioShack store that is first opened to the public after September 30, 2007. Next Generation POS Device means the POS Device that will replace the POS Devices that exist in RadioShack Stores as of the Effective Date. Any such device will include at least the same level of functionality for customers with visual impairments as provided by the Ancillary Raised Button Keypad. RadioShack Store(s) means retail stores owned and operated by RadioShack in California and other states across the United States, and does not include any franchised stores or sales kiosks owned or operated by RadioShack. The Full Agreement shall apply to RadioShack Stores in every State in the United States. The terms of the Full Agreement shall remain in effect from the Effective Date until June 30, 2008. 3. Provisions Regarding Ancillary Raised Button Keypads and Point of Sale Devices. 3.1 Installation of Ancillary Raised Button Keypad at Existing RadioShack Stores. By no later than September 30, 2007, RadioShack will install one Ancillary Raised Button Keypad as designated in 3.3 in each Existing RadioShack Store. 3.2 Installation of Ancillary Raised Button Keypads at New RadioShack Stores. During the term of this Agreement, at New RadioShack Stores, at least one Ancillary Raised Button Keypad shall be installed in each store prior to the time the store is open to the public in accordance with Section 3.3 below. 3.3 Locations of Ancillary Raised Button Keypads. The Ancillary Raised Button Keypad installed in each Store pursuant to Sections 3.1 and 3.2 shall be placed at an Accessible Checkout Counter that is open during all hours of Store operation. If customers are required to sign directly on the Point of Sale Terminal in order to complete a transaction, there shall be no virtual function keys below the signature line. 3.5 Maintenance of Ancillary Raised Button Keypads. RadioShack will use its best efforts to maintain all Ancillary Raised Button Keypads installed pursuant to this Agreement in operable, working condition except for isolated or temporary interruptions in service due to maintenance or repairs. No later than November 1, 2007, RadioShack will provide written confirmation to Claimants that the required Ancillary Raised Button Keypads have been installed pursuant to Section 3.1. No later than February 1, 2008, RadioShack will provide Claimants in writing with a list of New RadioShack Stores at which Ancillary Raised Button Keypads have been installed pursuant to Section 3.2. RadioShack will allow Claimants to test and provide feedback on any Next Generation Device under consideration by RadioShack during the Term of this Agreement, prior to any final decision being made by RadioShack regarding the Next Generation Device. Claimants shall provide any feedback within fourteen days of their testing. RadioShack will consider in good faith the feedback provided by Claimants but will not be in breach of this Agreement if RadioShack does not incorporate the feedback. RadioShack will retain the right to decide the type and nature of the Next Generation POS Device. 5. Training of RadioShack Personnel. On or before the date on which the Ancillary Raised Button Keypads are installed pursuant to Section 3.1, RadioShack will modify its current training materials to include instruction to its managers and sales associates regarding (i) the installation of Ancillary Raised Button Keypads; (ii) the reason blind RadioShack customers need the devices; (iii) the manner in which blind RadioShack customers use the devices; and (iv) guidelines for appropriate interactions with visually impaired customers using the Ancillary Raised Button Keypads. RadioShack will provide Claimants with a copy of the training materials prior to their being finalized. Review and distribution of the proprietary training material is to be limited to Claimants and their attorneys only for purposes of this dispute. All training material will be returned to RadioShack. RadioShack will consider the feedback provided by Claimants, but RadioShack retains full discretion over all matters relating to the training material, including their form, content, and implementation. All RadioShack managers and sales associates will receive the above-referenced training within sixty days after the date on which the Ancillary Raised Button Keypads are installed in their respective stores. 6. Provisions Regarding Accessibility of www.RadioShack.com. RadioShack will continue to use good faith efforts to ensure that all pages of www.RadioShack.com will substantially comply with the Priority One and Two checkpoints of the Web Content Accessibility Guidelines version 1.0 (hereafter “WCAG 1.0″ or “Guidelines”) by no later than December 31, 2007. The Parties recognize that some Priority One or Two checkpoints address features or design elements that may not be used on www.RadioShack.com and in such circumstances compliance with those checkpoints is not required. The parties agree that Section 6 of this Agreement does not apply to any information that is not on a www.RadioShack.com web page. For example, information on other pages linked to www.RadioShack.com are not covered by this Agreement. To the extent RadioShack hires contractors or vendors for website development and design work on www.RadioShack.com , it will make a good faith effort to locate and select contractors and vendors that are able to comply with the Guidelines. 6.3.1 By no later than October 31, 2007, RadioShack will test Third-Party Content on www.RadioShack.com for compliance with WCAG 1.0. Where RadioShack finds content to be non-compliant, within thirty days RadioShack will request in writing that third parties supplying web-content to RadioShack bring their content into conformance with the Priority One and Two Checkpoints of WCAG 1.0 to the extent applicable. 6.3.2 If, on or after the Effective Date, RadioShack issues requests for proposals or enters into contracts for development or inclusion of Third-Party Content on www.RadioShack.com, RadioShack will include compliance with the Guidelines as criteria in all such requests for proposals and vendor contracts. 6.3.3 Nothing in this Agreement shall preclude RadioShack from including Third-Party Content on www.RadioShack.com — even if such content does not comply with Priority One or Two Checkpoints of the W3C Guidelines — so long as RadioShack complies with Sections 6.3.1–2, above. 6.4.1 Claimants will notify RadioShack in writing when they believe there is a page on www.RadioShack.com that does not substantially comply with the Guidelines. 6.4.2 Within thirty (30) days of receiving written notice of any alleged instances of non-compliance, RadioShack shall respond in writing to the Notice. Within ten (10) days of receipt of the Notice, the Parties will meet by telephone in an attempt to informally resolve the issue. 6.4.3 If the issue remains unresolved, within 30 days of the final meet and confer RadioShack will hire a mutually agreed upon web consultant to provide an opinion on the issue. There will be no breach of this Agreement unless the consultant determines that the challenged web page or portion thereof, does not substantially comply with the applicable Priority 1 or 2 Guidelines. No breach of contract claims related to RadioShack’s obligations under this Agreement may be maintained by persons who are not Parties to this Agreement. Should the Parties have a dispute regarding the alleged noncompliance after the procedures set forth above have been exhausted, the dispute shall be handled pursuant to the procedures set forth in Section 8 of this Agreement. RadioShack will provide Claimants with a brief status report of its progress under Sections 6.1, 6.2 and 6.3 of this Agreement on June 30, 2007, and December 31, 2007. If WCAG 1.0 is superseded by a later version, such as the Web Content Accessibility Guidelines 2.0 Working Draft (”Version 2.0″) currently under development, RadioShack will have the option of complying with either Version 1.0 or Version 2.0. RadioShack will post information on its website, linked from the homepage, describing its efforts to comply with the Guidelines. RadioShack will provide a method by which users can notify the company about web accessibility concerns. RadioShack will notify visitors to www.RadioShack.com when they are linking to Third-Party content, as that term is used herein. At least once during the second or third quarter of 2007, on a date agreed to by the Parties, RadioShack will meet with Claimants’ representatives by telephone to discuss the accessibility of www.RadioShack.com, and affiliated websites owned and operated by RadioShack. The Claimants and RadioShack may jointly issue a press release announcing the terms of this agreement. If the Parties cannot agree on the language of a joint press release, either party may issue its own release provided that it be shared with the other Parties at least three business days prior to issuance and provided that the release is consistent with the terms of this agreement and reflects the collaborative method in which the Parties’ Dispute was resolved. 8.4.2 If the dispute is not settled in mediation, it shall be submitted to binding arbitration before an arbitrator affiliated with JAMS. The arbitration hearing shall be conducted, in accordance with the JAMS Streamlined Arbitration Rules & Procedures. However, those Rules will be modified as necessary to ensure that the hearing is held as soon as practicable after the submission to arbitration, and that a written decision on the matter is rendered within sixty (60) days of the last hearing date. The performance of RadioShack under this Full Agreement shall be excused during the period and to the extent that such performance is rendered impossible, impracticable or unduly burdensome due to acts of God, strikes or lockouts, or unavailability of operable parts, equipment or materials through normal supply sources. If RadioShack seeks to invoke this Section, it shall notify Counsel in writing as soon as reasonably possible, specifying the particular action that could not be performed and the specific reason for the non-performance. Counsel and RadioShack will thereafter meet and confer regarding an alternative schedule for completion of the action that could not be performed, or an alternative action. Any dispute regarding the applicability of this Section, or any future action to be taken, that remains after the meet and confer session will be handled as a dispute pursuant to Section 9 of this Full Agreement. In entering into the Full Agreement, RadioShack does not admit, and specifically denies, that it has violated or failed to comply with any Access Laws. By: Frank C. Morris, Jr., Esq. ; Minh N. Vu, Esq. This document is the legal agreement signed by RadioShack with the American Council of the Blind (ACB), the American Foundation for the Blind, and the California Council of the Blind (CCB). RadioShack agreed to make changes so blind people could use payment cards and enter their own PIN. RadioShack agreed to add keys to their payment devices that a person can feel. Every store in the U.S. will have a keypad. RadioShack also agreed to make changes to its website. The changes will make it easier for people with disabilities to use the site. Lainey Feingold and Linda Dardarian were the lawyers for the blind community. No lawsuit was filed. Instead, a formal process known as Structured Negotiations was used.